This document is the seventh edition of this overview of mobile Web applications technologies. The previous edition was released in May 2012. A live version of this document accepts contributions in the W3C Wiki. Feedback on every aspect of this document should be sent to the author (dom@w3.org) and will serve as input for the next iteration of the document. The features that these technologies add to the Web platform are organized under the following categories: graphics, multimedia, device adaptation, forms, user interactions, data storage, personal information management, sensors and hardware integration, network, communication and discovery, packaging, performance & optimization. a link to the test suite for the said feature. “Working Drafts” are early milestones of the Working Group progress. “Candidate Recommendations” trigger a call for implementations where implementers are invited to implement the specification and send feedback; Working Groups are expected to show the specification gets implemented by running test suites they have developed. “W3C Recommendations” are stable and completed Web standards; these documents only get updated rarely, through the “Edited Recommendation” process, as a results from errata collected by Working Groups. In complement to the declarative approach provided by SVG, the <canvas> element added in HTML5 enables a 2D programmatic API that is well-suited for processing graphics in a less memory intensive way. That API not only allows rendering graphics, but can also be used to do image processing and analysis. Both SVG and HTML can be styled using CSS (Cascading Style Sheets); in particular, CSS3 (the third level of the specification) is built as a collection of specifications set to offer a large number of new features that make it simple to create graphical effects, such as rounded corners, complex background images, shadow effects ( CSS Backgrounds and Borders ), rotated content ( CSS 2D Transforms ), animations ( CSS Animations , CSS Transitions ), and even 3D effects ( CSS 3D Transforms ). Animations can be resource intensive — the possibility offered by the Timing control for script-based animations API to manage the rate of updates to animations can help keep them under control. Fonts play also an important role in building appealing graphical interfaces, but mobile devices are in general distributed with only a limited set of fonts. WOFF ( Web Open Font Format ) addresses that limitation by making it easy to use fonts that are automatically downloaded through style sheets, while keeping the size of the downloaded fonts limited to what is actually needed to render the interface. Another important aspect in graphics-intensive applications (e.g. games) is the possibility to use the entire screen to display the said graphics; the Fullscreen API lets a Web application requests and detects full screen display. NB: work on defining a 3D graphic API called WebGL has started outside of W3C, as part of the Khronos Group; this API has been built to be compatible with OpenGL ES, i.e. for embedded systems, and is intended to work on mobile devices. HTML5 adds two tags that dramatically improve the integration of multimedia content on the Web: the <video> and <audio> tags. Respectively, these tags allow embedding video and audio content, and make it possible for Web developers to interact much more freely with that content than they would through plug-ins. They make multimedia content first-class citizens of the Web, the same way images have been for the past 15 years. The Pick Media Intent offers a Web-intent based approach to search and retrieve locally or remotely stored media content, while the Networked Service Discovery and Messaging API opens the door for integrating DLNA-hosted content into Web applications. While the new HTML5 tags allow to play multimedia content, the HTML Media Capture defines a markup-based mechanism to access captured multimedia content using attached camera and microphones, a very common feature on mobile devices. The Web Real-Time Communications Working Group and the Device APIs Working Group are building together an API (getUserMedia) to directly manipulate streams from camera and microphones. Beyond recording, two additional APIs add multimedia manipulation capabilities to the Web platform. We have already mentioned the Canvas 2D Context API: it enables modifying images, which in turn opens up the possibility of video editing. In a similar vein, the Audio Working Group is working on an API that that makes it possible to modify audio content, as well as analyze, modify and synthesize sounds, the Web Audio API, in favor of which the competing proposal called MediaStream Processing API has been abandoned. The Media Capture task force is currently evaluating if and how to expose capabilities from camera and microphones to make it possible to take advantage of the large variety of media capturing devices provided on mobile phones. CSS Media Queries offer a mechanism that allows adapting the layout and behavior of a Web page based on some of the characteristics of the device, including the screen resolution. CSS Device Adaptation defines a set of CSS directives to define the size on which this layout should be based, relatively to the size of the underlying device — specifying what has been implemented using the <meta name="viewport"> element so far. The Responsive Images Community Group has been exploring proposals to make it possible to load and display images in HTML that are best adapted to the resolution of the device, and is now looking into incorporating a <picture> element in HTML5. Complementarily, the WHATWG is discussing a proposal for a srcset attribute that would let Web developers define the various existing resolutions of an image, letting the browser pick the best choice for the resolution of the screen. the new <datalist> element allows creating free-text input controls coming with pre-defined values the user can select from. An increasing share of mobile devices relies on touch-based interactions. While the traditional interactions recognized in the Web platform (keyboard, mouse input) can still be applied in this context, a more specific handling of touch-based input is a critical aspect of creating well-adapted user experiences, which Touch Events in the DOM (Document Object Model) enable. The work on that specification is now nearly finished, as the patents that had been disclosed have been determined to not apply. But as the Web reaches new devices, and as devices gain new user interactions mechanisms, it also becomes important to allow Web developers to react to a more abstract set of user interactions: instead of having to work in terms of “click”, “key press”, or “touch event”, being able to react to an “undo” command, or a “next page” command independently of how the user instructed it to the device will prove beneficial to the development of device-independent Web applications. Work on abstract DOM events that would address this need is planned as part of a joint task force between the Web Events Working Group and the Indie UI Working Group. Mobile devices follow their users everywhere, and many mobile users rely on them to remind them or notify them of events, such as messages: the Web Notifications specification proposes to add that feature to the Web environment. The hardware constraints of mobile devices, and their different usage context can make mobile users experience similar barriers to people with disabilities. These similarities in barriers mean that similar solutions can be used to cater for them, making a Web site accessible both for people with disabilities and mobile devices a natural goal. How Web Content Accessibility Guidelines (WCAG) and User Agent Accessibility Guidelines (UAAG) provide guidance on mobile accessibility — that is, making websites and applications more accessible to people with disabilities when they are using mobile phones and a broad range of other devices — is discussed in Mobile Accessibility. 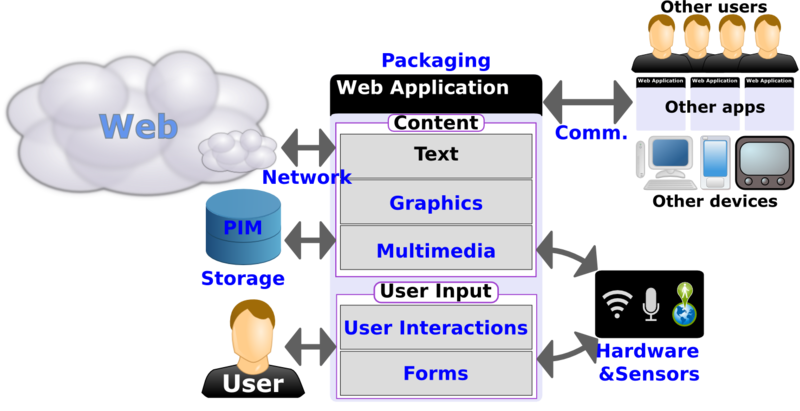 For richer interactions, the Web platform has a growing number of APIs to interact with a device filesystem: the File Reader API makes it possible to load the content of a file, the File Writer API allows saving or modifying a file, while the nascent FileSystems API give access to more general file operations, including directory management. As more and more data need to be stored by the browser (e.g. for offline usage), it becomes critical for developers to get reliable storage space, which the proposed Quota Mangement API will offer to Web applications. Applications can benefit from integrating with existing data records; on mobile devices, the address book and calendar are particularly useful source of information, which the Contacts API and the Calendar API bring access to. The Geolocation API provides a common interface for locating the device, independently of the underlying technology (GPS, WIFI networks identification, triangulation in cellular networks, etc.) The proposed second version of that API which would have added the ability to retrieve a civic address matching the user’s current location, has been abandoned due to lack of demand. The work on a generic Sensor API has been put on hold in favor to designing APIs for specific sensors, such as the Proximity Events API, the Ambient Light Events API or the proposed Ambient Humidity Events API. Discussions on enabling Web applications to use Near-Field Communications (NFC) mechanisms have led to a proposed charter for a dedicated Working Group, and would likely lead to the creation of a dedicated Working Group, currently under review by W3C Members. A more global access to sensors and hardware (including USB and bluetooth) would be in scope for the proposed new System Applications Working Group, currently under review by W3C Members. XMLHttpRequest (the “X” in AJAX) is a widely deployed API to load content from Web servers using the HTTP and HTTPs protocol: the W3C specification (formerly known as XMLHttpRequest Level 2 ) completes the existing deployed API with the ability to make requests on servers in a different domain, programmatic feedback on the progress of the network operations, and more efficient handling of binary content. The work on documenting the currently deployed API (XMLHttpRequest Level 1) has been abandoned in favor of getting the new API developed more quickly. Early work on a Push API would allow Web applications to receive server-sent messages whether or not the said Web app is active in a browser window. The network-information API addresses discovery of the network characteristics, allowing to determine for instance the rough bandwidth of the current connection. Coverage of XMLHTTPRequest "level 1"
Beyond connection to on-line services, allowing communications between users, but also between devices and between applications is an important aspect of a good mobile development platform. To communicate with unknown devices or pre-existing services, a discovery component is critical. The Messaging API completes the existing ability to create and send message through links (with sms:, mms: and mailto: URI schemes) with more control on adding attachments and the success of the message sending. At this time, this API is likely to be entirely replaced by an approach based on Web Intents . The postMessage API of HTML5 Web Messaging allows for Web Applications to communicate between each other. Work has started in a joint task force of the Device APIs and Web Apps Working Groups that open up possibilities of closer integration of Web applications, as well as of Web applications with native applications via a mechanism called Web Intents. The Networked Service Discovery and Messaging API offers to discover services on the local network (such as the ones offered via DLNA), enabling mobile Web applications to integrate seamlessly with these services. An important aspect of the user experience of applications is linked to how the user perceives the said application is available permanently (even when off-line, which is particularly important on mobile devices), as well as how it can be shared and distributed, typically through purchases via applications stores — this is adequately addressed by packaging the application. the W3C Widgets family of specifications define technologies for distributing Web applications as Zip files which include a configuration file (see Widget Packaging and Configuration ); this configuration file enables the inclusion of additional features such as signature of applications , controlled access to advanced APIs, restricted network usage, etc. In addition to aiding in the development of client-side Web applications for mobile devices, W3C Widgets have been used as server side-applications, standalone applications, daemons, starting point for hybrid Web/native applications, and as a Browser extension format. As part of its new charter, the Web Apps Working Group is considering to work on an evolution of the Widgets configuration file based on a JSON format, although the latest discussions on it have established a likely dependency with the proposed new System Applications Working Group. The work started by the Web Performance Working Group on Navigation Timing , Resource Timing , and more recently Performance Timeline and User Timing , gives tools to Web developers for optimizing their Web applications. The proposed work on Efficient Script Yielding offers the opportunity to Web developers to use more efficiently asynchronous programming. The Mobile Web Application Best Practices provide general advice on how to build Web applications that work well on mobile devices, taking into account in particular the needs for optimization.